There's something about Tallahassee - the vibe that seems to run throughout the city. It's welcoming, comfortable, friendly. If the tree lined streets and quaint neighborhoods weren't enough, the number of Tallahassee attractions and green space around every corner make the city all the more impressive. If you're wondering what to do in Tallahassee in a few short hours or a week or more, we have a few favorites to share, and there's much more. Our first visit to Tallahassee this spring was a wonderful surprise as we continued along our Gulf Coast Road Trip through Louisiana, Mississippi, Alabama, and back into Florida. It was also a stereotypical reminder of how often residents are unfamiliar with the treasures in their own state (granted, Florida is a big state and Naples is a good six hours from Tallahassee). What we discovered was a vibrant city with a small town feel, and plenty to see and do including one of the most vibrant food scenes in the country. It's the state capital of the Sunshine State, and a great deal has been devoted to showcasing Florida's history and local culture through some excellent museums, and the presence of Florida State University influences both the cultural atmosphere and the artistic face of the city as well. It's a great city for a Florida vacation. Established in 1963, the LeMoyne Center is in the beautifully restored Meginniss-Munroe House that dates to 1854. The house sits on an equally beautiful tree-lined street in downtown and includes a second historic property that's used for art education. Between the two houses is a lushly planted garden complete with thirteen original sculptures and fountains. At the right time of year when the plantings are in full bloom this is a lovely place to stroll and can be booked for weddings or other special events. The main house has five gallery rooms on the first floor which showcase various artists throughout the year. We were fortunate to be able to experience the unique work of Stuart Riordan during our visit. In the basement, there's a ceramics lab used by artists and for classes offered by LeMoyne. One of the instructors who is also a participating pottery artist had us try our hand at shaping a simple pot from clay. I don't know if our final pieces were pots or maybe saucers but the experience was informative, fun and so relaxing. 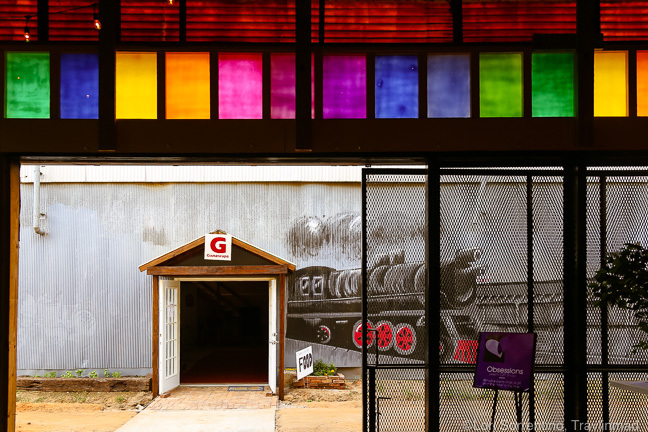 Originally a lumber yard and later the Downtown Industrial Park, this 10-acre complex has been repurposed into a community of one-of-a-kind retail shops and restaurants, artists' studios and whimsical galleries - including Florida State University's studio artist program. There's also a coffee shop, herb shop, a workout center and rock climbing gym, and an outdoor adventure company with kayaks for sale. Crumbox Gastgarden, one of the more unique places to eat in Tallahassee, is housed in an old railroad caboose and a great spot to enjoy live music after a day of browsing Railroad Square Art Park. And for the ultimate in unique special events, the Mickee Faust Academy for the Really Dramatic Arts is one of the coolest performance venues we've ever seen, guaranteed to delightfully alter your view of just about everything! Do yourself a favor and spend an afternoon here going from colorfully-adorned building to building, shop to shop, visiting and chatting with artisans and vendors. We can't say enough about this friendly and unique small business community and commend the owners for creating what is truly a creative expression of Tallahassee culture. Proof Brewing, Tallahassee's largest independently owned brewery, produces a full range of craft brews including ales, lagers, stouts, and IPAs. Using state of the art brewing equipment they have created several award winning beers in their main brewhouse while in their pilot brewhouse they are continually experimenting to develop new craft lagers and ale. In the comfortable tasting room there's a full line of their beers as well as a few guest brews. On Friday nights, there's live music in the covered beer garden and the relaxed setting encourages socializing. They're planning on a new and much larger location, but as of this writing, they're still in the Railroad Square Art Park. Don't worry, they'll still be creating these great beers in Tallahassee. This isn't your run-of-the-mill museum. None of the museums in Tallahassee were. But the Tallahassee Museum is unique in that it's mostly outdoors. 52 well-maintained acres showcase North Florida's natural environment, and you can explore Florida wildlife exhibits and nature trails, much of which are on elevated boardwalks that weave through gardens of native greenery. The animals here are solely indigenous Florida wildlife, either raised in captivity or recovering from injury. Both situations would limit their ability to survive in the wild, so they are cared for here and protected while providing an educational opportunity to all who visit. There are historic and cultural exhibits designed for visitors to learn about the history and diverse communities in the area, and if you're lucky you'll hit it right when the living historians are baking something yummy in the 1880s farmhouse. We had such an interesting conversation with two ladies in period attire as they were getting ready to bake cookies in a cast iron wood stove using an original recipe with ingredients that would have been available at the time. We enjoyed the presentation so much we bought one of their cookbooks, also with all original period recipes. Throughout the property, you'll see Jim Gary's Twentieth Century Dinosaurs exhibit, 21 large brightly colored sculptures of dinosaurs recycled from old junkyard car parts. 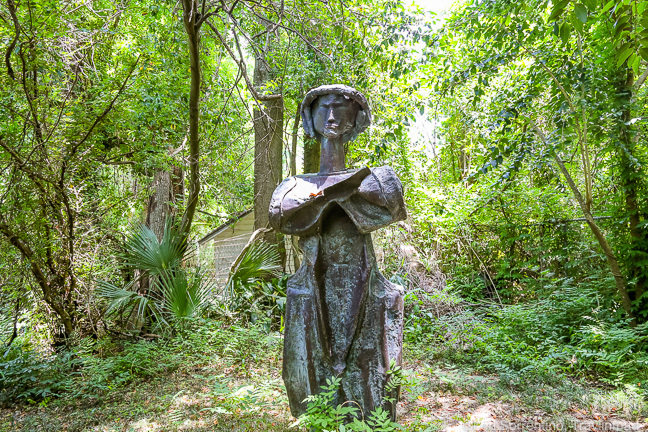 Wonderfully imaginative, they're tucked into the native vegetation along the nature trails. You can't miss them - some are 43 feet long and weigh two tons. Hungry for a bit more adventure? Try ziplining with Tree to Tree Adventures Tallahassee. They run zip lines around the property, with ropes to swing around obstacles, log bridges to cross, and lots of fun to be had. As the westernmost Spanish mission in Florida, Apalachee Indians and Spaniards lived together at Mission San Luis from around 1656 to 1704. The only reconstructed Spanish mission in Florida, at one time 1,400 people called this home. A great deal of archaeological and historical research has been done to bring the Mission back to life on the 63-acre site and it's well worth a visit. The number of excavated Apalachee and Spanish sites here has amassed an archaeological collection of over 950,000 artifacts, representing one of the largest collections of 17th century Spanish and Apalachee materials in the world. 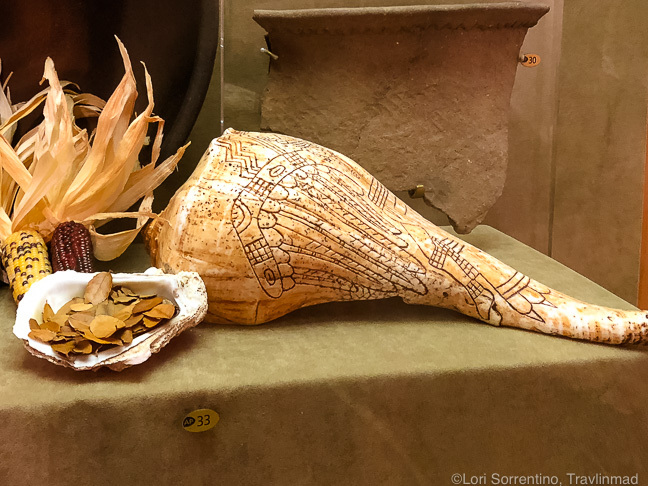 Visit the exhibit gallery where many of the artifacts are on display including devotional objects from the same period fashioned in the Roman Catholic tradition. The reconstructed buildings and grounds are as beautiful as they are interesting. The sheer size of the Council House is so impressive and makes you wonder how they constructed such a huge structure - it's magnificent inside and out. 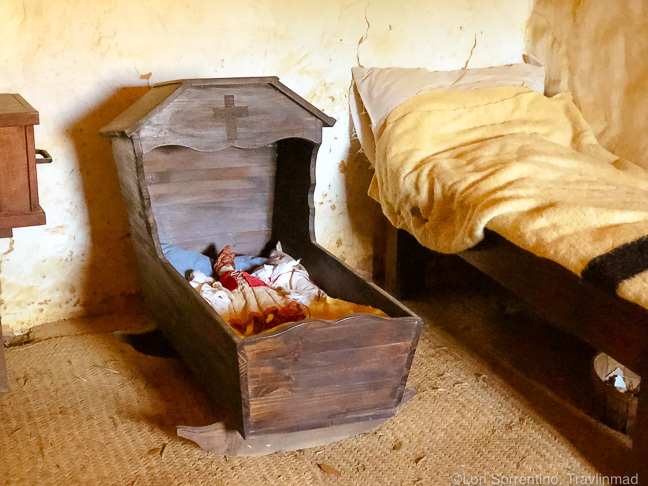 There's also a reconstructed church, Friary with a separate detached kitchen, working blacksmith shop, Spanish house, and an area known as the Camino Real which includes an outdoor kitchen and gardens. The 2-story Fort building toward the back of the property - complete with surrounding stockade made of logs - shows what life was like for Spanish soldiers. Nothing fancy here, the fort was functional for defending against enemies with all the facilities and stores that the soldiers would have needed, including cannon placements. Don't let a history museum scare you off - we promise this is a lot more fun than that! We wound up staying for over 2 hours - there's that much to see and learn. The Museum of Florida History first opened in 1977 to preserve and exhibit the history and cultures of Florida. There's everything from a giant mastodon skeleton and Florida's first inhabitants to early Spanish history (there's a replica of a sailing ship that you can board) through the American Civil War and World War II. There are artifacts from every era as well as wonderful photos. But one of my favorite parts was Florida's recent pop culture and tourism - it was like looking back on early family vacation! Naval Ships Named Florida - We had no idea there were so many. Starting with the USS Florida, a sailing ship in operation from 1824-1831 up to the present ultra hi-tech Trident class submarine, U.S.S. Florida in service since 1983, there have been six other vessels proudly named Florida. Forever Changed: La Florida 1513-1821 - Chronicles the landing of Ponce de Leon in 1513 and the interactions of Spanish colonialism and native cultures. The exhibition shows Florida's sometimes turbulent past and the events and periods that have influenced Florida's present. The museum keeps things fresh and interesting by adding attractions from time to time through its TREX Traveling Exhibits program. As a fun educational experience, this museum is hard to beat. We love communities who don't shy away from highlighting local public art. It's fun. And there's a lot of it in Tallahassee. But more than that, we think having public art (whether it's a commissioned art installation or street art) sends an important message to residents and visitors alike that the community values art - enough to display it proudly - and chooses a vibrant and inspiring canvas over a concrete wall or lifeless space. To us - and apparently Tallahassee too - it's a no-brainer. So this is one Tallahassee attraction that's just 15 miles from the city, but a world away and so worth a visit. If you're not familiar with the numerous crystalline and natural warm springs throughout north-central Florida, you really should be. These gorgeous spots are still largely under visited by tourists coming to Florida. If you're looking to escape some of Florida's hectic man-made attractions around Orlando, we highly recommend checking out these springs. And when you're in Tallahassee, Wakulla Springs is a must-visit for the nearest place to cool off in the summertime, and see what many call "the real Florida". Wakulla Springs makes a great day trip from Tallahassee, or you can stay overnight in their comfortable historic Lodge on site. Take an educational and entertaining boat tour around the Springs for a nominal fee, and bring a picnic lunch for the family. Then you and the kids can splash the day away in the water crystal blue water. Set on 24 acres Cascades Park is the social center of downtown Tallahassee. There's a lot going on here. There's a large children's play area, an interactive water fountain, multi-use trails, and a Smokey Hollow Commemoration. But the star of our visit was the beautifully Capital City Amphitheater, designed with plenty of seating and an excellent sound system, and there's not a bad seat in the house. If you'd rather, you can spread out a blanket on the lawn with your picnic and refreshment of choice. It was our good fortune on a warm and clear evening to enjoy the Southern Shakespeare Company's performance of Romeo and Juliet as part of the annual FREE Shakespeare in the Park Festival. The folks in Tallahassee truly know how to enjoy a midsummer night. Toward the middle of the park is the red brick Prime Meridian Plaza, where you'll find a granite map of Florida inside showing the Prime Meridian Marker. Originally placed in 1824, it serves as the beginning point for all land surveys in Florida. If we'd have had a change of clothes or bathing suits we would have joined the kids having a blast playing in the arcing streams of water at Imagination Fountain just off the Prime Meridian Plaza. Interestingly the park was designed to keep surrounding areas from flooding during severe storm events by diverting excess stormwater runoff into a series of underground channels, culverts, and retention ponds. This system in turn protects the park from pollutants which can be contained in the runoff. No matter where we wandered in the park - the play, kids having a good time, folks just relaxing - all were enjoying themselves. Kudos to Tallahassee for an excellent repurposing of this urban space. We loved Tallahassee, and you will too! “Tally” is a vibrant city and easy to get around. We found plenty of things to do and experience during our short time there. No matter where we went, we never got the sense that it's overly crowded. Maybe when FSU is in full session it changes things a bit, but it’s hard not to fall in love with a university town that’s got exciting arts and culture, a fun and creative restaurant scene, the state government seat and rich history, and enough quirky spots to keep it all in balance. We’ll definitely return to nurture our newfound love of our state capital.